The Times-Picayune first broke the story that no bidders stepped forward to lease 22,000 square feet of city land to build an 8-story, $17 million, 140 room hotel on the $807 million airport terminal development on the north side of the existing Louis Armstrong, so they reached out to Louisiana Commercial Realty president Robert Hand for an explanation. Louis Armstrong International Airport’s plan for a prominent hotel at the front entrance to its new $807 million passenger terminal failed to attract interest from developers, despite an unprecedented hotel boom unfolding in downtown New Orleans. The New Orleans Aviation Board did not receive any responses to its recent request for proposals to build a nationally branded, full-service, 140-room hotel connected to the terminal, which is under construction and slated to be finished by October 2018. The deadline to respond to the hotel request was Sept. 16. Robert Hand, president of Louisiana Commercial Realty, said the airport is asking too much — at least $550,000 annually — to make the project attractive for a developer. “The money that they’re asking makes it unfeasible if you work through the numbers,” Hand said. Airport hotels attract companies that want a convenient place for regional employee meetings, he said. The meetings can be held at the hotel, and employees can use their evenings off to go into the city. There also limitations on what brand the airport could attract, he said, depending on what brands already have hotels in the area. The new terminal project, which all-told would include nearly one-billion dollars investment including a new interstate flyover and a hotel, is slated to open Oct. 1, 2018. 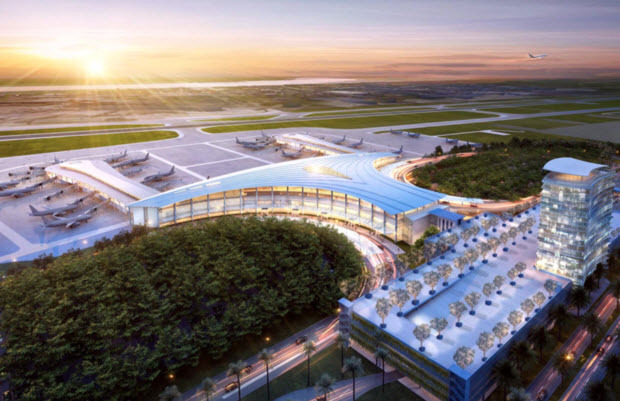 Armstrong Airport currently leases 22 gates to airlines and has seen huge growth in passenger traffic which is expected in 2016 to surpass its all-time record of 10.6 million passengers in 2015, so the new terminal will have 30 gates with an option to expand to 42. As for the existing terminal, concourses A, B (Southwest) and C (American, Alaska, JetBlue and others) will be demolished. The airport intends to repurpose concourse D (Delta, United) for charter services and administrative offices. The airport had hoped to have a lease negotiated, approved by the City Council and signed by Dec. 16. Airport leaders estimated the hotel would be a $17 million project. The city and the New Orleans Aviation Board were seeking a 30-year lease deal that would require a developer to pay about $103,000 a year in rent and a minimum of $450,000 every year to share in revenues. Across the metropolitan area, the New Orleans market has added more than 4,000 rooms in 23 hotels to its hospitality stock in the last six years, according to Smith Travel Research. Developers have turned to historic tax credits to renovate old office towers in the Central Business District into hotels and apartments, while hotels continue to be developed and renovated in the Warehouse District and near the Ernest N. Morial Convention Center. Tourists and convention visitors drive demand in the city’s core.